The early morning adventure begins as you meet at our corporate office: 5601 Eagle Rock Avenue NE, Albuquerque, NM 87113. After check-in, you’ll step into our chase vehicles and be driven to one of our various launch sites. From there the pilots will begin the inflation process, giving you the opportunity to become an involved, “hands on” crew member as the gentle giants come to life. You may also choose to observe inflation and take pictures as the sun rises over the Sandia Mountain Range. Make sure you bring your camera! At lift off you’ll embark upon a journey of uniqueness. 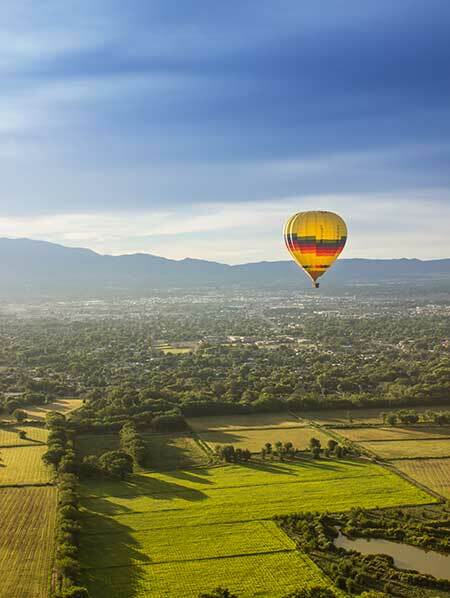 Enjoy breathtaking views of the Rio Grande Valley and majestic Sandia Mountains while floating across the sky. Send your greetings to the earthbound folks below!